On Sunday 29th September members of the Keytek® Emergency Locksmith cycle team took part in the ‘Glastonbury Bike Ride2013’ in aid of the British Heart Foundation. 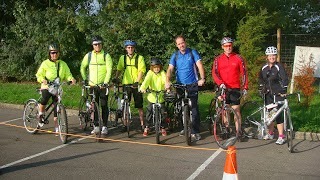 So far the team have managed to raise over £2,250, which is a fantastic achievement. Those who participated had the choice of taking part in a steady 27.5 mile route or a more challenging 50 mile route alongside picturesque Somerset countryside which included the famous Glastonbury Tor. Although there were some bumps on the road which included Technical Director, Chris who seemed to not have the odds in his favour (we will go into more detail later on) and poor Andy, Technical Supervisor at Keytek®, who hurt his knee! Not to worry because the team had the support of Marketing Manager Kim’s lovely mum, Valerie, who supplied plenty of refreshments which included scrumptious sausage rolls and her moral support to the team. Unfortunately for the cycle team the route finished on a rather steep hill, as described by Kim: “You could ski off it!” but they all managed to complete the route and some celebrated with a well deserved cider on the way home! The day for some (Chris) began on a rocky start, unfortunately the odds did not seem to be in Chris’ favour due to a power cut that morning and therefore he was unable to get any of his kit for the 50 mile cycle because his garage door is electronic, this included a fundamental item… his bike! Although he did manage to borrow a bike from another staff member unfortunately it had a flat tyre but he didn’t give up! He replaced the flat tyre and proceeded to the meeting point in Glastonbury, Somerset. Disaster struck again – as soon as Chris arrived and tried on a borrowed pair of cycle shoes he realised they were two sizes two small but instead of giving up, he carried on and not only did he complete the 50 mile cycle challenge – he did whilst in pain! Just to finish off the day he then lost his keys and spent at least half an hour searching the entire van including it’s contents looking for them to find they were in his pockets after all! Despite the odds Chris managed to still take part and had a well deserved pint afterwards. According to the British Heart Foundation, “collectively, heart and circulatory diseases cause more than a quarter of all deaths in the UK, accounting for more than 159,000 deaths each year.” All money raised in sponsorship by the Keytek® cycle team will help the British Heart Foundation to fund vital research into heart disease. To find out more about the British Heart Foundation and their fundraising events please visit www.bhf.org.uk. Therefore everyone who took part in the ‘Glastonbury BikeRide 2013‘ deserves a huge congratulations and a pat on the back for their efforts on Sunday.